Do Not Jill, 1966. Collage: 19 x 15-1/2. Richard L. Feigen. Snake Has a Heart, 1966. 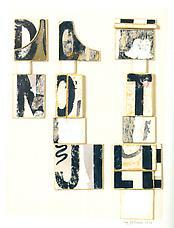 Collage: ink, paint, paper, boards, sandpapered, mounted on painted board, 27 x 13-1/2. Collection Lois and Georges de Menil. 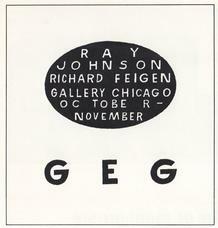 Exhibition advertisement in the October 1967 issue of Artforum designed by Ray Johnson.